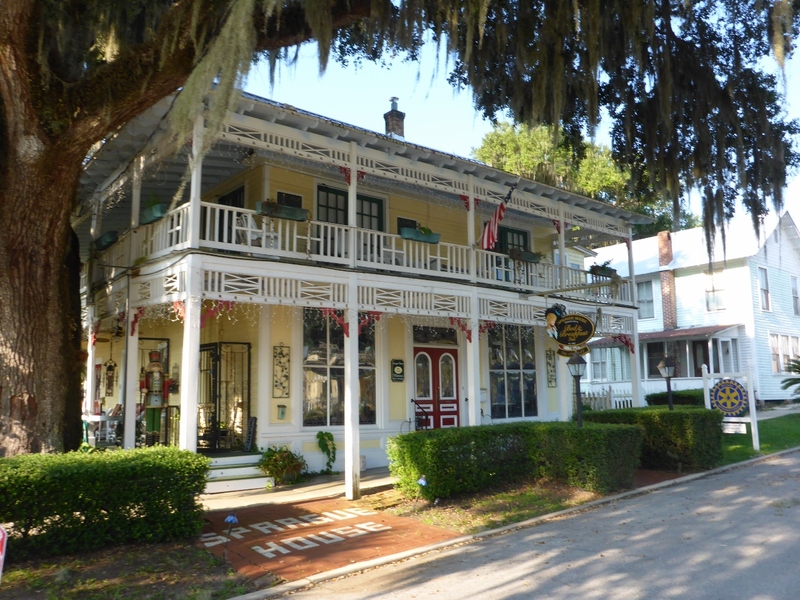 Leaving the Sprague House in Crescent City. A curious thing: even with all the information at my fingertips, one thing I haven’t focused much attention towards over the past week has been the temperature. I hear it’s been sort-of hot. Out on the road you just listen to what your body tells you, not the thermometer or the internet. Strangely, while we finished 62 miles at 2:PM yesterday, we felt hotter today finishing 38 miles around noon. On a scenic Putnam County backroad. Today’s route was similar to yesterday’s, with some rolling and curving roads passing through farms and forests. These are the type of roads that make bicycle touring most enjoyable, as the scenery changes more quickly, and you have to focus on shifting. It was an uneventful day with light traffic, a bit of tailwind, and some wildlife sightings, such as wild turkeys, sandhill cranes, a swallow-tail kite, a yellow pine snake, and a luna moth. The kind of day I recall from the solo bicycle touring days of my youth, when it was just the landscape rolling by, and “attractions” were of little or no concern. This time I got to share it with my wife and some great friends. 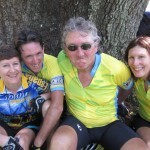 Ted Wendler met us at the entrance of DeLeon Springs State Park for a photo-op and to ride with us the rest of the way into DeLand. We were back on familiar roads, and seeing familiar faces. The afternoon off-bike gave us time to enjoy our favorite DeLand restaurant, De La Vega with another old friend, Leigh Matusick, and take a short nap. Dinner with Sandra and John. 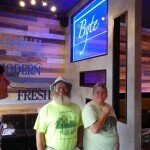 Later we shared drinks at Cafe DaVinci with our tour planners Herb Hiller and Ted, and Florida Hikes! 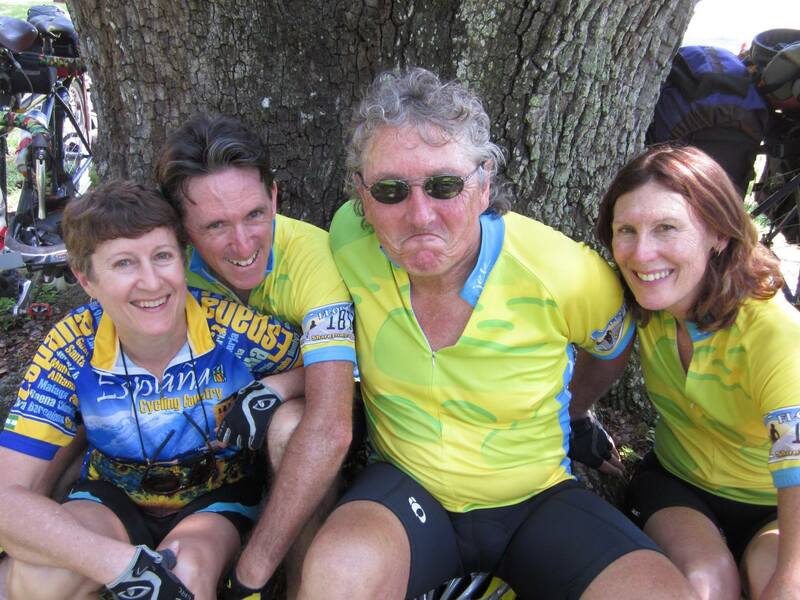 writers Sandra Friend and John Keatley, who’ve been excited to share our story and rediscover cycling as well. 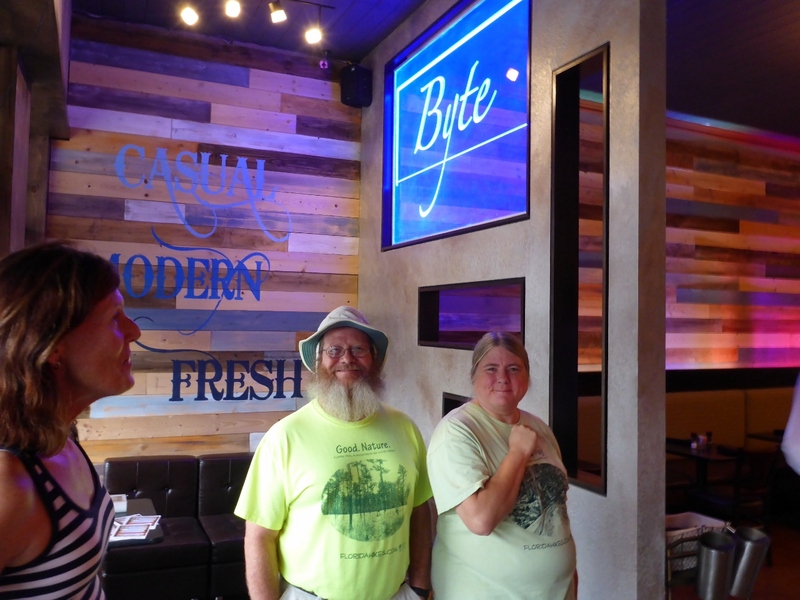 Dinner was at Byte, a new place that’s reflective of the changes happening in downtown DeLand, from sleepy southern college town to hip bedroom community of Orlando. 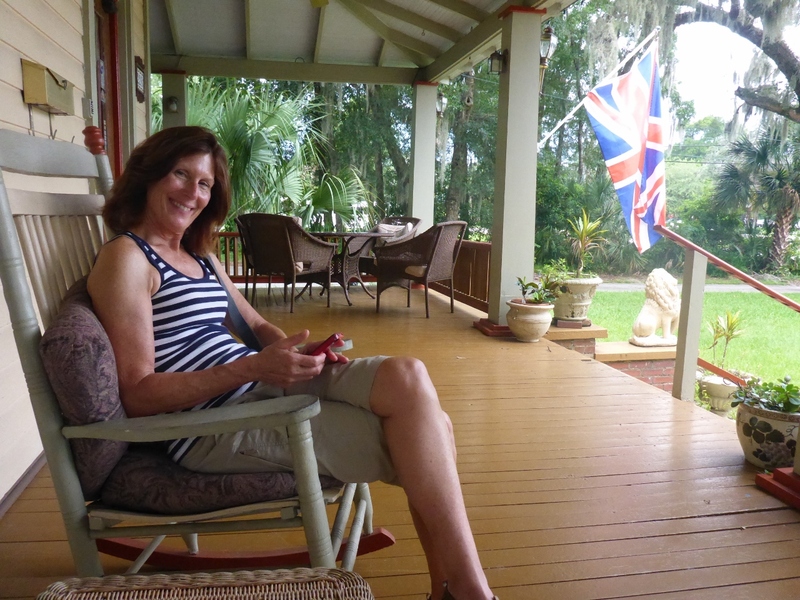 Laura Hallam taking a break at DeLand Country Inn. 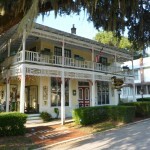 A thunderstorm cooled off the evening air for our stroll back to the DeLand Country Inn Bed & Breakfast. Time to rest up for one more day of riding. 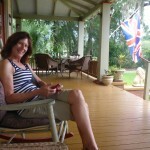 You can also follow our exploits on Facebook at First Florida Rail to Trail Tour.